When we decided to move to Seattle in the middle of 2014, I was bummed that it meant I probably wouldn’t meet my goal of cooking with my dad at least twelve times before the year was over. I’d been having a lot of fun learning how to make some of the things my dad makes that I love most, and I’d really been enjoying collecting my dad’s stories. Plus, you know how I feel about goals and failure. Our year in Seattle was really hard in some ways, not least of which was feeling so far from my family. I had never lived outside of Colorado, and I’d always been in a pretty consistent rhythm of seeing my parents and siblings regularly. I missed them a lot, especially in the earliest days of my pregnancy. My mom and dad made it work to fly to Seattle and spend five days with us after Abe was born, and they were some of the sweetest days of my life so far. Partly because my mom did all of our laundry and my dad cooked us three meals every day, but mostly because it took me by surprise how incredible it felt to see them love my baby the way they did, they way they do. They held him and sang to him and changed his diapers, and I wept uncontrollably the day they left. Just a few weeks later, we made the move back to Denver with our boy. It’s taken me a little while to make plans for cooking with my dad again, but I’ve had these last two recipes in mind since before we even decided to move away. I've been so excited just thinking about sharing this with you. Christmastime has always been special for my family, and this recipe has long been a Christmas morning staple. You know, the thing you snack on with your coffee while you wait for the main event breakfast/brunch? You know. My dad told me he thinks this recipe came from one of my aunts, but he couldn’t remember for sure. 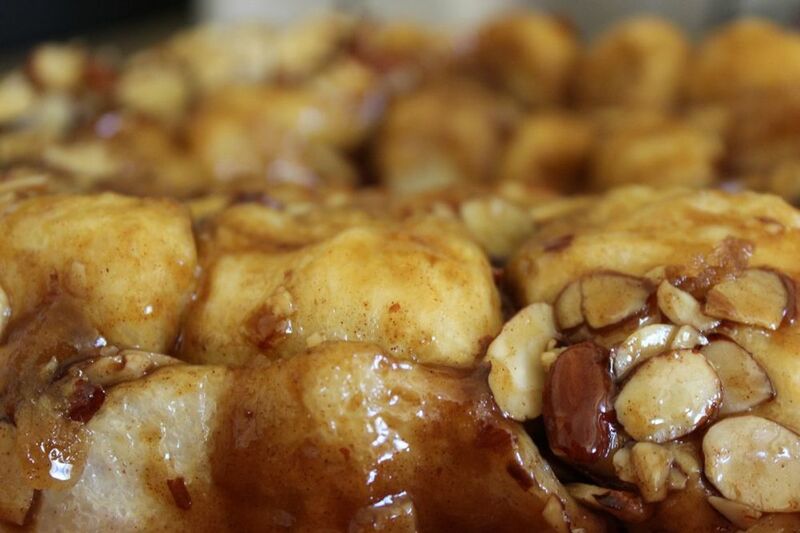 I’m certain there are endless versions of sticky buns out there, but I feel confident that these are the only ones I’ll ever make. They taste like my childhood and Christmas. Plus they’re SO quick and easy, there’s kind of no reason not to make them (unless you don't eat gluten or sugar or dairy). You still have time to pick up all the ingredients and prep them for this year's Thanksgiving morning, in fact. You could eat them while you watch the Macy's Parade! 1. In a small mixing bowl, stir together the cook & serve, brown sugar, and cinnamon. 2. 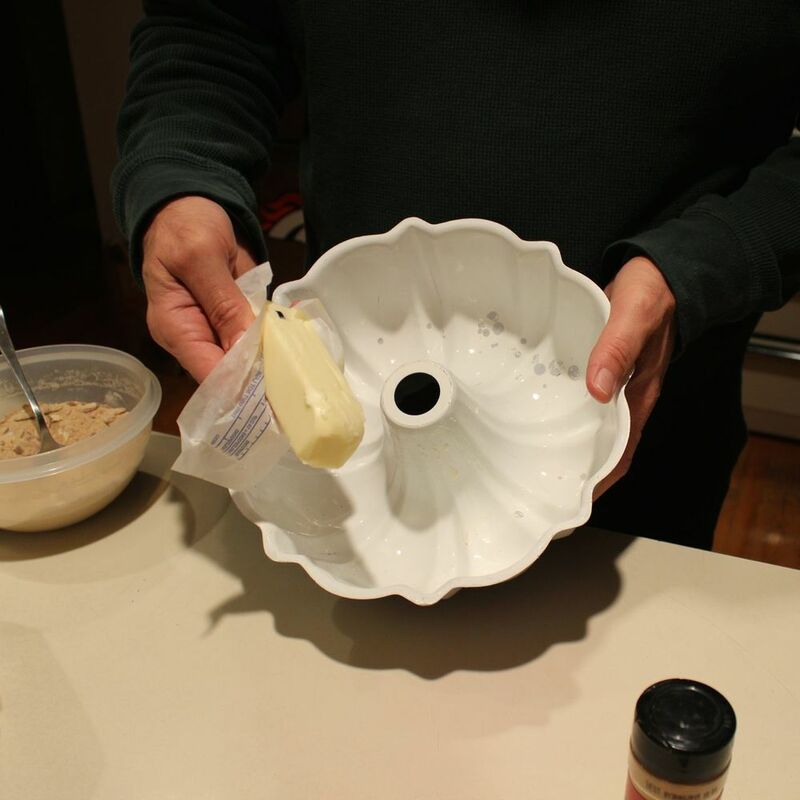 Grease a bundt pan with the stick of butter, then melt the remaining butter and find a plate/platter big enough to cover the top of your bundt pan. You'll need it when you pull them out of the oven. 3. Arrange the frozen rolls in the bundt pan, making sure to count out exactly 20. 4. 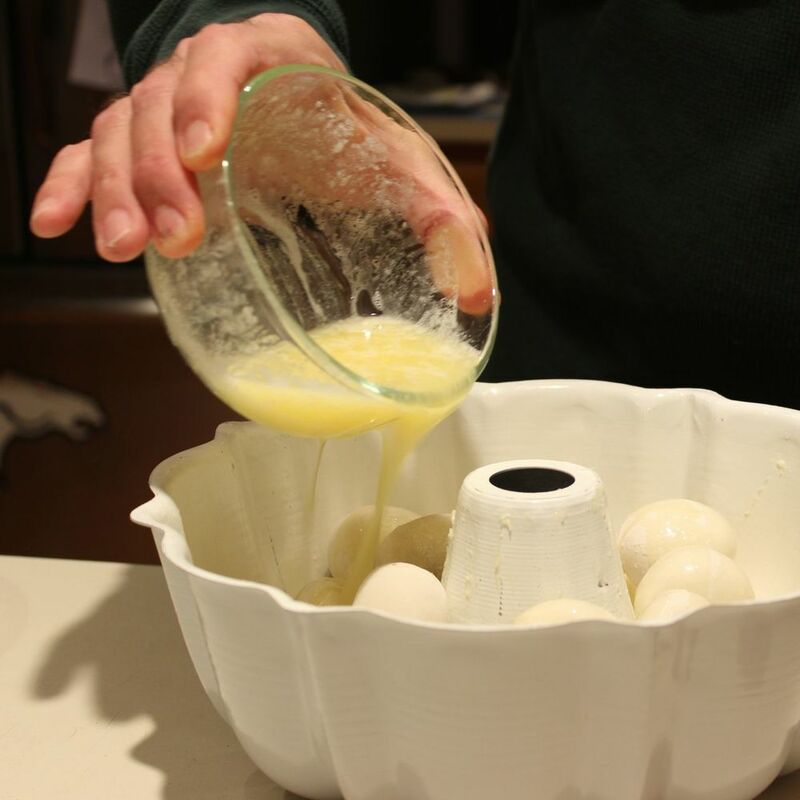 Drizzle the butter over the top of the frozen rolls, making sure to coat the tops of all the rolls. Also make note of the melted butter pooled at the bottom of the bundt pan - it will be HOT later. 6. Preheat your oven to 350 before making your morning coffee. When it’s warm, slide your bundt pan/cookie sheet combo in for 30 minutes. You want the tops of the rolls to be a nice, golden brown on top. 7. 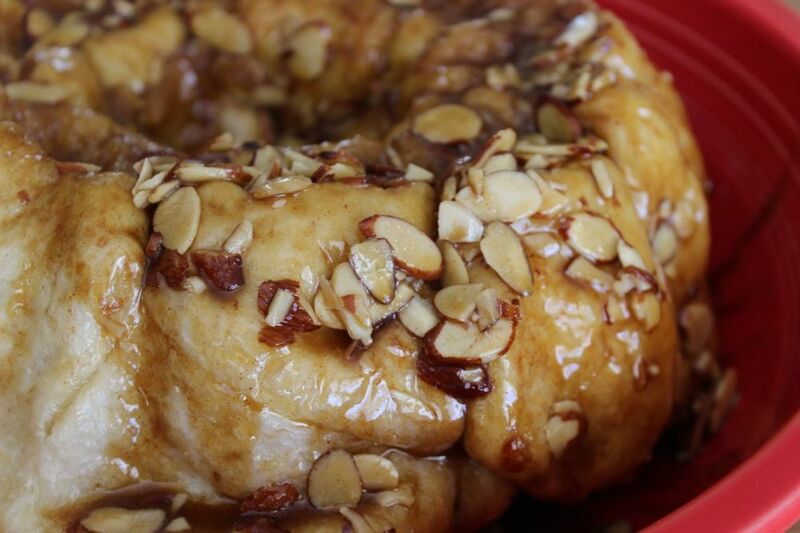 As soon as you pull the pan out of the oven, cover it with your plate/platter and flip the sticky buns out of the bundt pan. Be careful not to burn yourself with the hot butter, and be prepared to dirty your oven mitt/towel/whatever you use to take hot dishes out of the oven. 8. 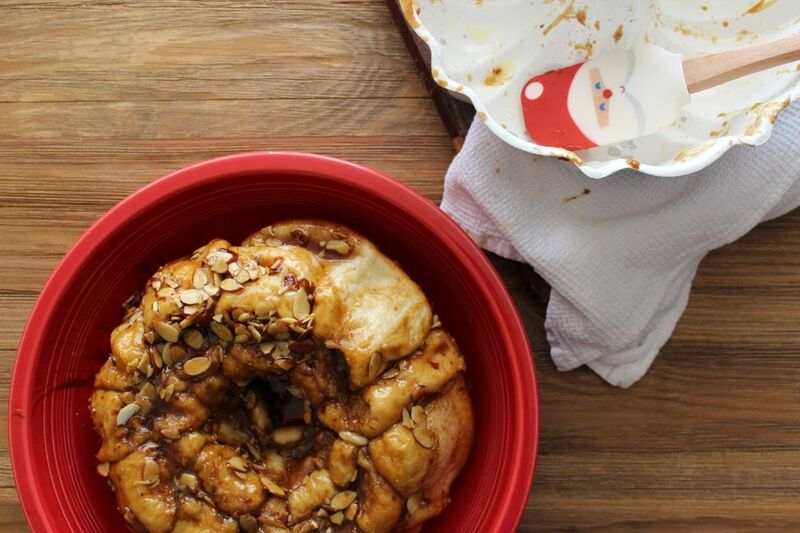 Use a spatula to clear all of the sticky butter/sugar out of the bottom of the bundt pan and drizzle over the top of your sticky buns. 9. Make some more coffee and get ready to party! One of my goals for 2014 was to write one “Have At It” post per month, to include a story from my dad’s life with one of his recipes. I figured if nothing else, it would give me some motivation to get serious about getting my dad’s stories down, even if I had to write them myself. I only got ten recipes down in 2014, due to moving out of state and birthing my first child, so I'm finishing up the last two now in November and December, 2015. I used to think my dad was friends with Dan Reeves. From the way he talked to the TV during Broncos games, I figured they were buddies. I imagined them meeting for lunch during the work week and occasionally going out for a beer. Reeves took over as head coach of the Broncos the same year I was born, and by then my dad was a committed Broncos fan. I didn’t know until this past Sunday that my dad (who grew up in the Bay Area) was a 49ers fan as a kid and even a Raiders fan for a bit before he moved to Denver. For as long as I’ve known him, he’s been a faithful Broncos fan, no matter how good or bad the team is. My dad at Super Bowl XXII in San Diego. Please make note of his 3/4 sleeves and stonewashed, pleated jeans. When we showed up at my parents’ house for the game on Sunday, my dad had a batch of his famous salsa chilling in the fridge, a pot of jambalaya on the stove, and the fixings for buffalo chicken dip all ready to be tossed together. 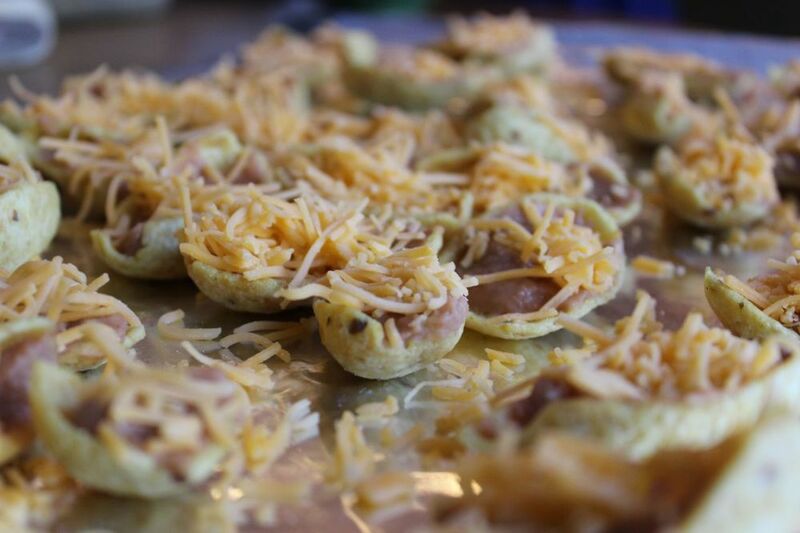 My favorite thing he was working on, though, were these treats I’ve named “Bean Dip Poppers”. I can remember eating these for as long as I can remember knowing my dad loves the Broncos, and they are delicious. 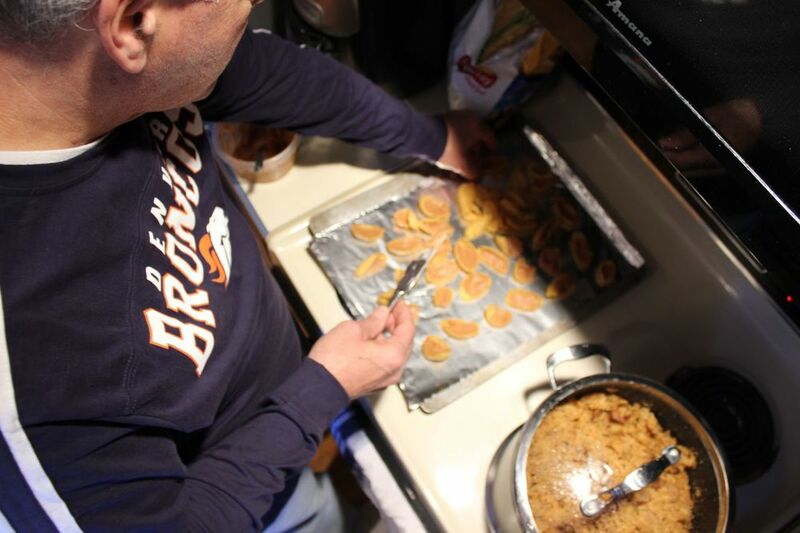 While he worked in the kitchen and I rifled through the trash looking for the lid to the bean dip can so my photos would look good, I asked my dad to tell me the story of his life as a Bronco fan. It goes back to his days as a visiting student athletic trainer at Stanford. My dad was a student at Cal State Hayward (now known as CSU East Bay) when some football coaches he’d known in high school recommended him as a student trainer to cover an open position for part of the summer at Stanford. Apparently someone had missed the fact that the incoming freshmen trainers wouldn’t be arriving on campus early enough to be there when football started, so my dad got to fill in and work (as much as a student trainer does with a head coach) with John Ralston, who would later become the head coach of the Broncos. According to my dad, Stanford was one of only a few schools that had a degree program in athletic training at the time and, had he stayed in California, he would have applied and likely gotten in. Instead, he joined a band and hit the road. My dad and his siblings were a touring band for a number of years in the 70s, and the music is what ultimately led my mom and dad to meet each other. Once the band settled in Denver (after doing things like USO tours in Europe), they had a standing gig at the restaurant where my mom worked as a server, and the rest is the history that explains my existence. When I asked my dad if he remembered when he officially became a Broncos fan, he told me he and my mom got to go to a number of the home games when they were dating because my mom’s parents had season tickets. That, coupled with the fact that John Ralston (who he'd worked with at Stanford) was the coach, made him take an interest in his new hometown team. One of my favorite things about my dad’s history as a Broncos fan is that he and his band recorded a song with former Bronco John Keyworth in 1977. Legend has it that during the 1977 AFC Championship pre-game show, NBC aired a live performance of the song at Keyworth’s restaurant, and my mom and her sister were in the audience. I tried contacting NBC Sports to ask if they have video proof of this event, but no one got back to me. When I was a kid, my dad would play the 45 of ‘Make Those Miracles Happen’ over and over for me and my siblings. He had us convinced that if we believed in miracles and wiggled our noses when the song ended, the record would magically start playing again. We were too young to realize his record player had a “repeat” function. 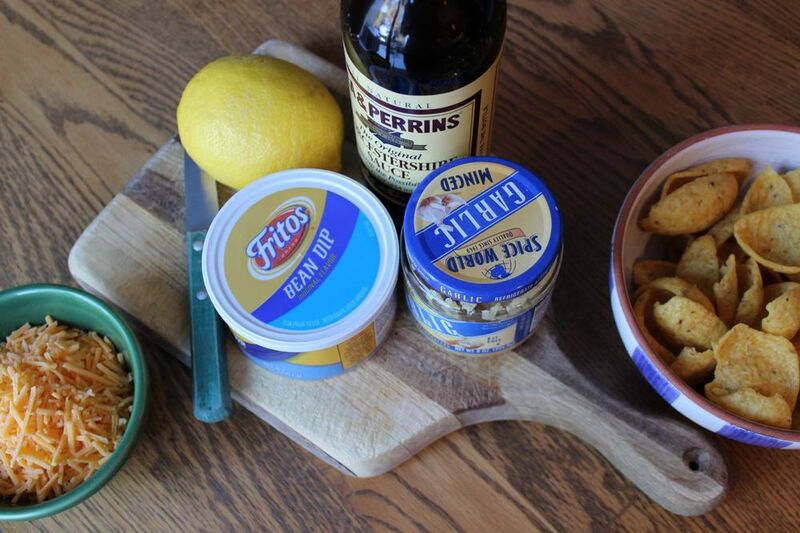 1) In a small bowl, mix the worcestershire sauce, garlic, and lemon into the bean dip. 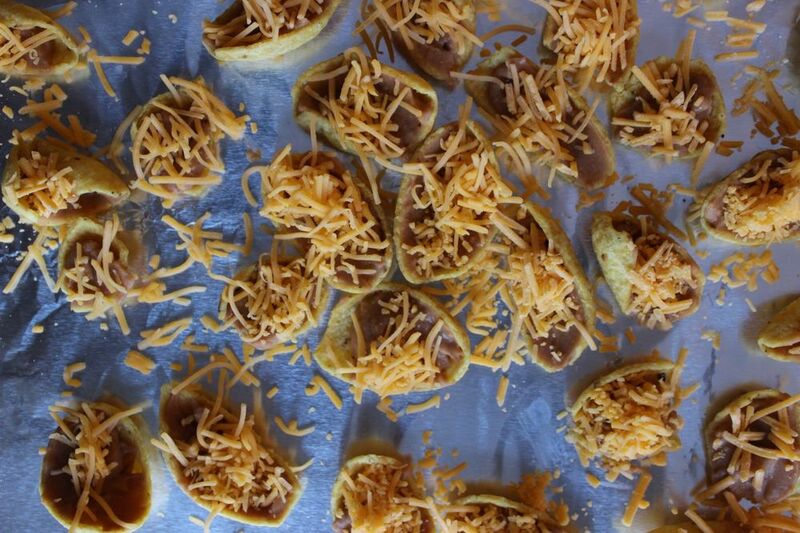 2) Spoon dip into chips, then place them onto a foil-lined baking sheet. Sprinkle cheese over the top of each chip. 3) Broil the chips for a few minutes, until the cheese is melted. Let cool long enough to avoid burning your mouth. Enjoy! One of my goals for 2014 is to write one “Have At It” post per month, to include a story from my dad’s life with one of his recipes. I figure if nothing else, it will give me some motivation to get serious about getting my dad’s stories down, even if I have to write them myself.